Introducing our Featured Projects and builders! Here you will be able to see at a glance some of our most advanced Hangar 45 projects and the builders behind those fantastic Lear45 Simulators! In the future as more builders and their flightdecks come on line and approach 80% or better completion, we will add them to this distinguished list of Featured Projects! 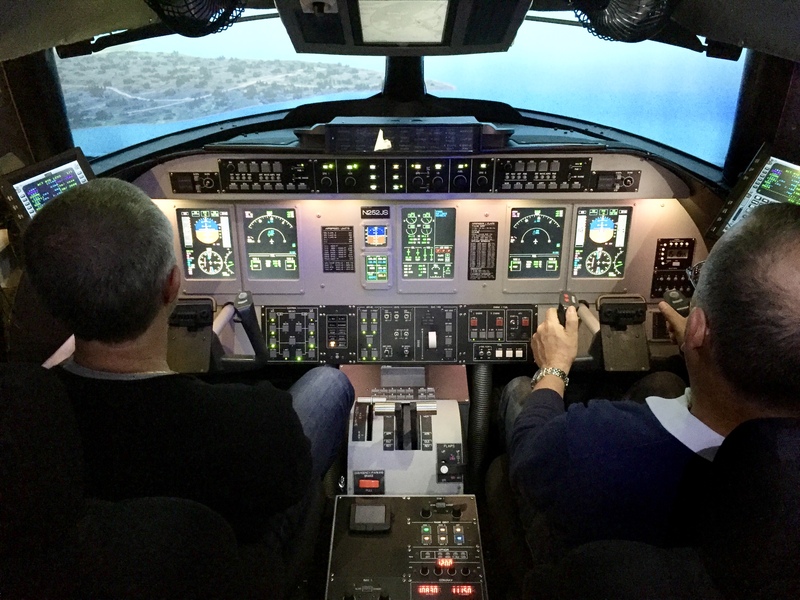 The Project45 Flagship Learjet45 Simulator! 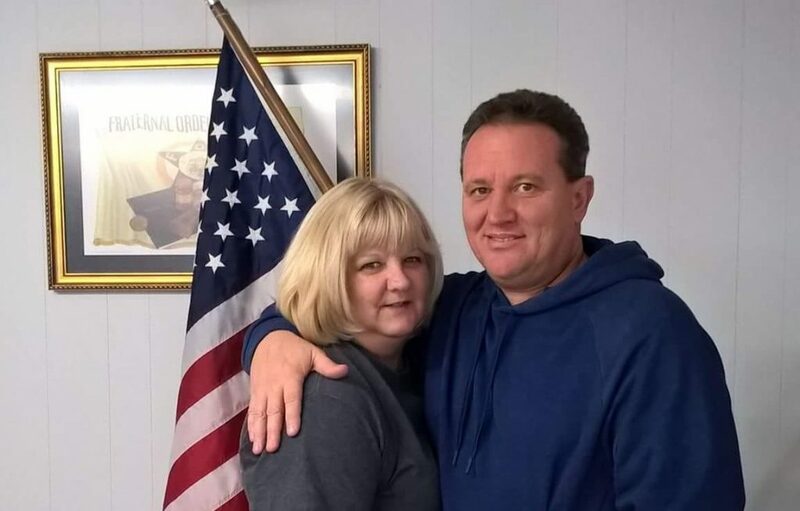 Ron Rollo is located in Jacksonville Florida and is happily married to his wife Michelle. Ron and Michelle have a son Christopher, a late son Zack who passed away in May 2016 and daughter Morgan. They also have a grandson Jett, who really loves flight simulation, he just does not know it yet! Ron is currently at the end of his professional law enforcement career after 25 years with the Jacksonville Sheriff’s Office. 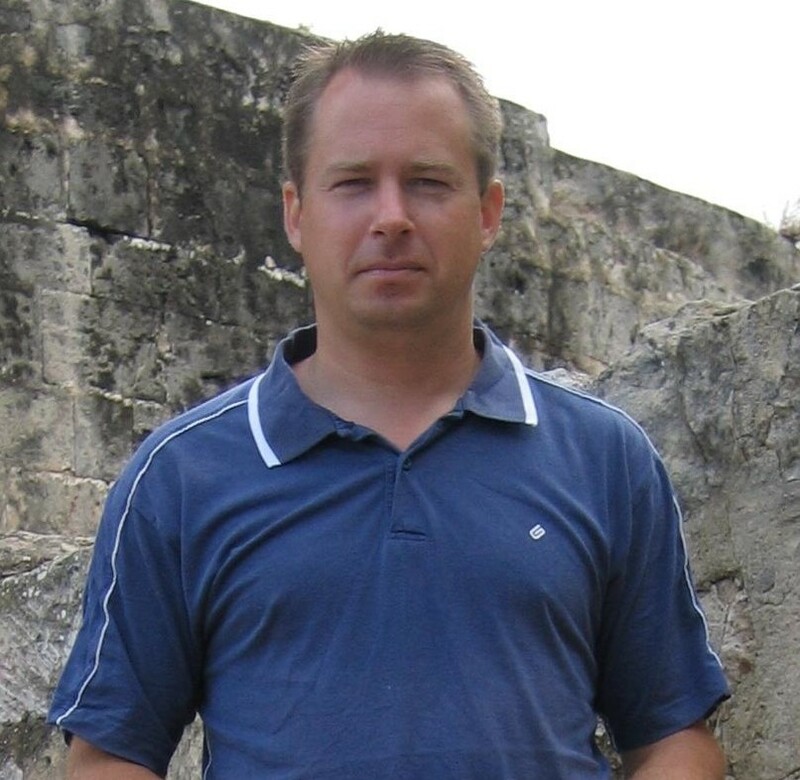 Ron is the owner and administrator of Hangar45.net and his personal project website, Project45.us The seeds to build a full scale flight simulator were planted back in the early 1990’s when he served in the United States Navy Reserve (U.S.N.R.) and was a crewman on the P3-C Orion aircraft. 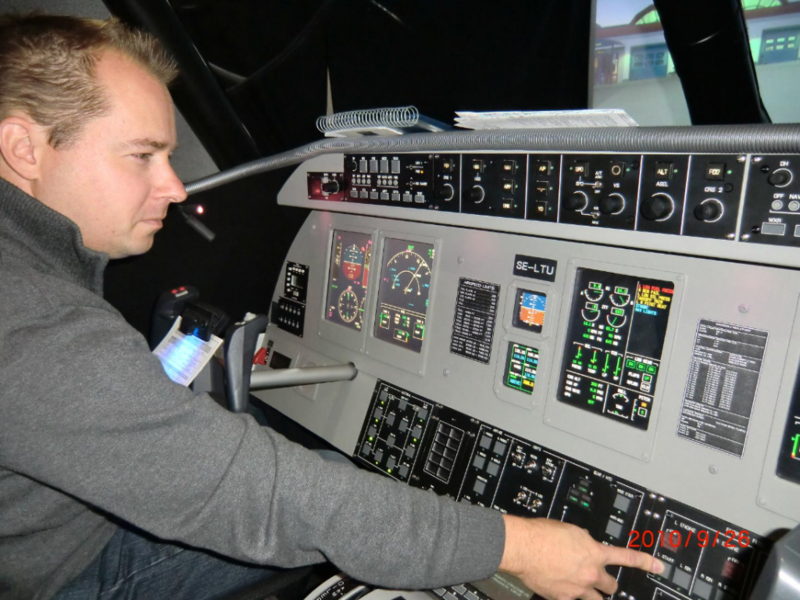 In 2007 after about two years of planning and research, he decided to build a Learjet 45 by taking a much different approach than every other builder across the flight sim community. 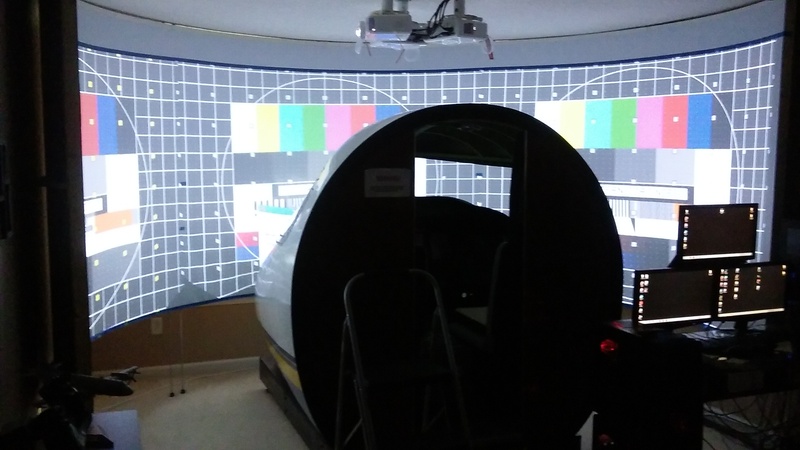 Ron decided to immerse into the simulation experience by starting with the outside creating a full size fiberglass cockpit shell as close to the real dimensions as possible! 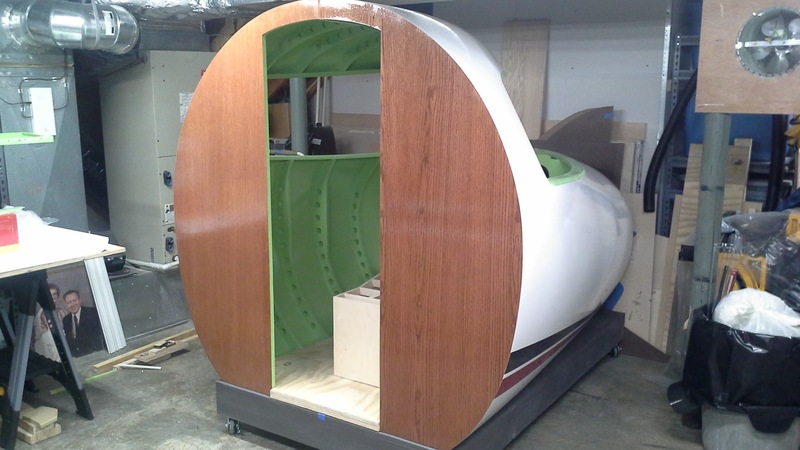 Visit his website Project45.us to see his L45 shell and the latest progress. 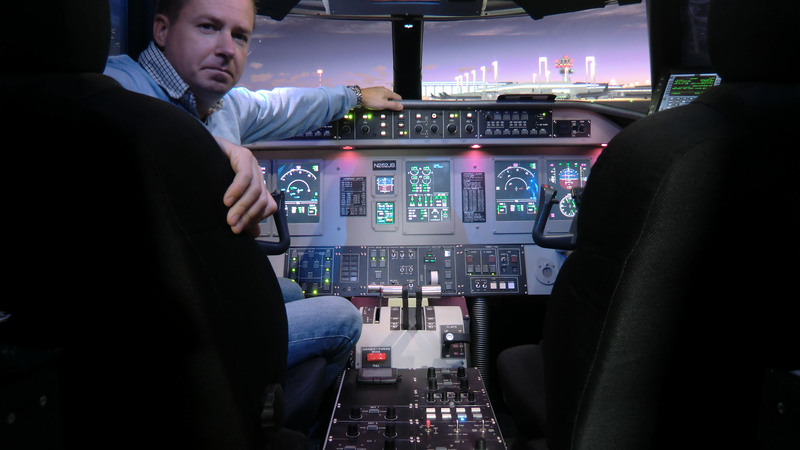 Ron is best known in the flight simulator community for his incredible talents with modeling, scaling and working on an issue until it is either solved or proven impossible to solve. His attention to detail and ability to work through problems comes from his model building and his military background. 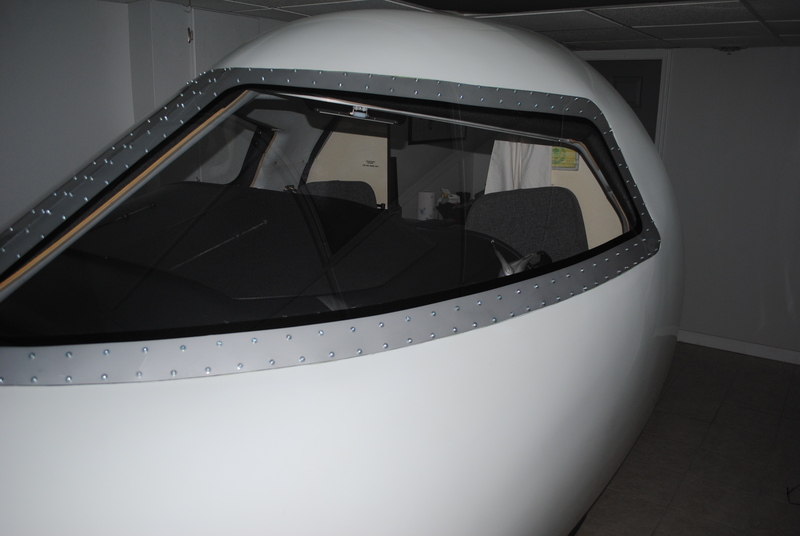 Ron realized early on that a hobby project of this magnitude could not be achieved on his own which is why he has dedicated so much time into building a community of like minded Lear45 flight simulator builders. Information sharing is key! 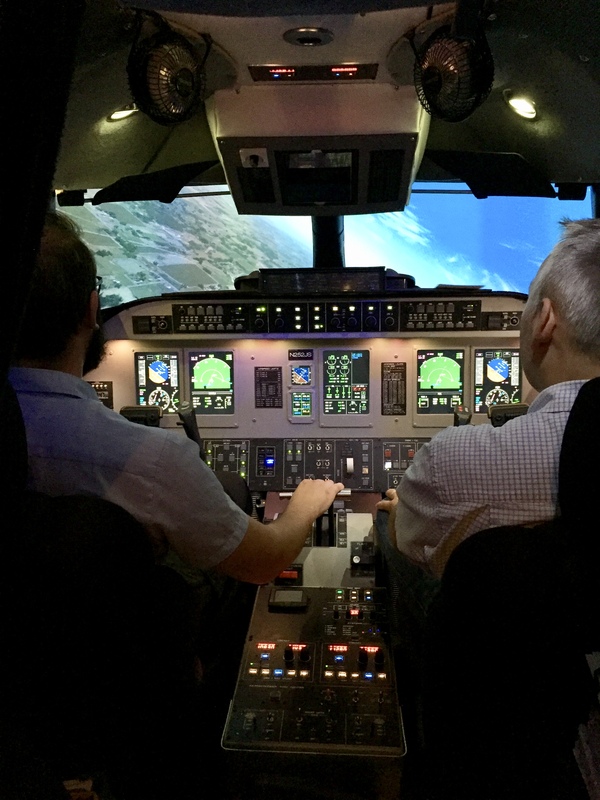 In addition to laying the foundations to the Lear45 sim community, he has also scaled out the Lear45 flight deck to as close to one to one scale as possible and shared that information here in the hangar! Ron has designed, built and made available to our Hangar 45 members countless key parts to the Lear45 simulator. Everything from the fiberglass shell, interior structural parts, control columns, back lit panels and other miscellaneous parts and products. Ron owns a CNC and does all of the drawing, programming, cutting and finishing work himself. Only the laser engraving is sent out to a third party specialty shop! 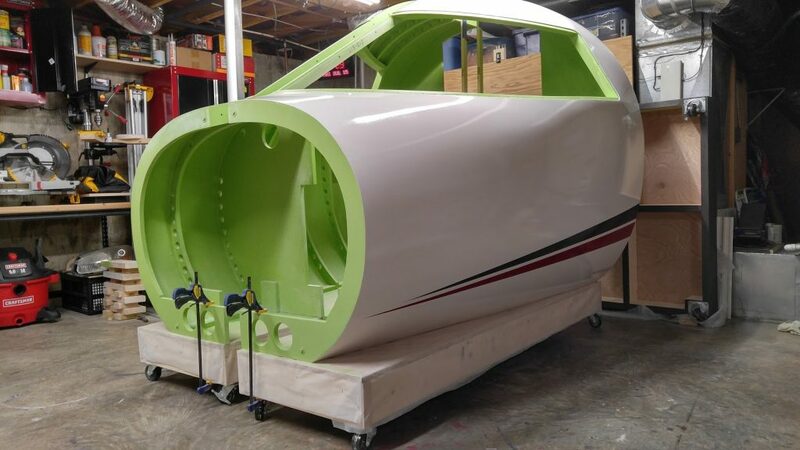 The goal for the past ten years and for many years into the future is to build the best Learjet 45 simulator possible and to continue making parts and products available for our Hangar 45 community! The most Advanced Lear45 Project in the World! Location: Mt. Sterling, Kentucky U.S.A.
Shane Barnes represents a textbook reason why Hangar45 was created. 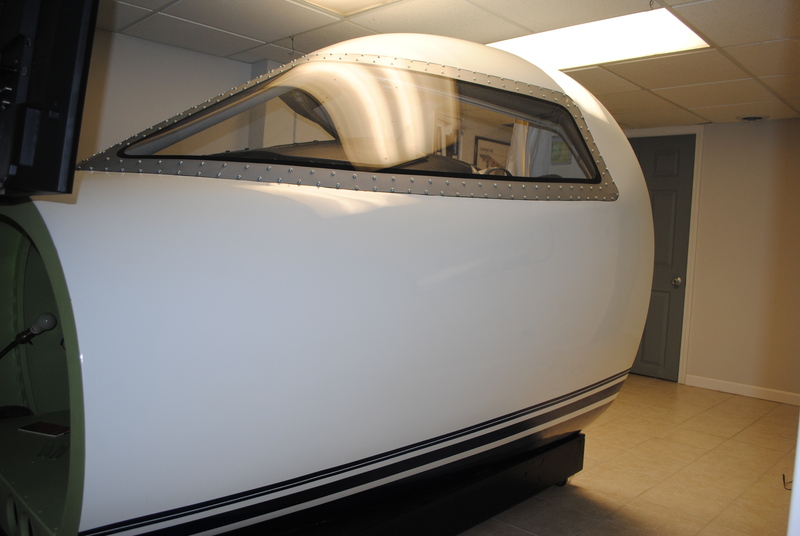 Hangar45 and the knowledgeable Club Members here have given Shane the confidence to build a Lear45 simulator! Shane lives in Mt. Sterling, Kentucky and is married with three step-daughters. He is a 25 year veteran of law enforcement and works as an arson investigator with an agency in the great state of Kentucky. Shane worked in patrol for seven years before being assigned as a detective. During his time as detective, he has been assigned to narcotics, general investigations, fatal accident investigations and for the last ten years to arson investigations. Shane has lived most of his adult life in Kentucky and most of his childhood in Spartanburg South Carolina. He graduated High School in Kentucky and joined the Kentucky National Guard as a Military Policeman for six years. During that time he was fortunate enough to get some flight hours as a “PAX” in the C-130’s, KC-135’s, Huey’s and Blackhawk helicopters. Shane’s father was a private pilot for many years and he was able to get some flight time in Cessna 172’s before his father bought a Piper Archer. Shane enjoyed flying but at the time did not have the desire to become a pilot and now feels that he has missed his big chance. Shane’s wife purchased FS2004 several years ago and he became interested in the hobby. He had been flying with just a joystick and in 2008 he thought it may be more realistic with a yoke and pedals! When Shane started an online search, he found many sites dedicated to home cockpit building and was hooked! 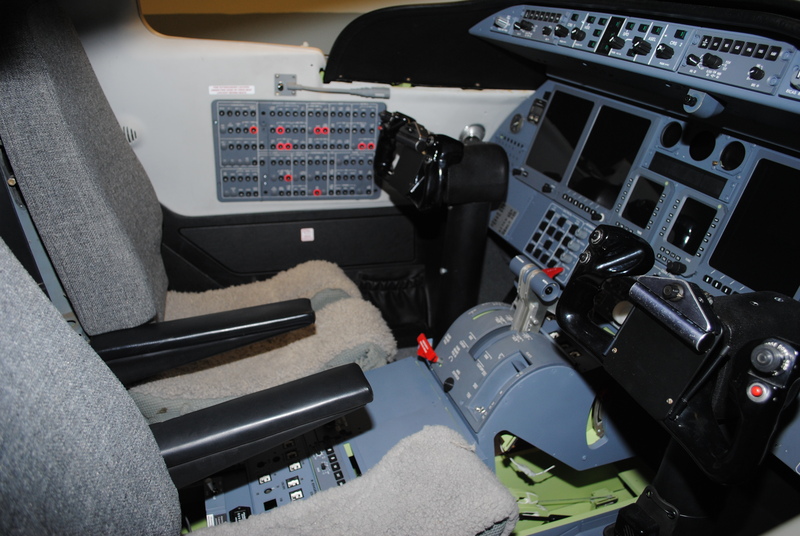 Shane started off with the idea of building a King Air cockpit. 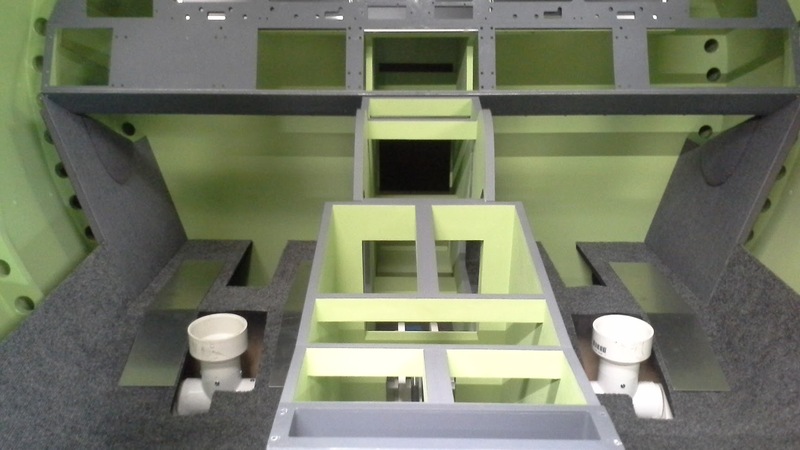 Shane built an enclosed cockpit loosely based upon the King Air dimensions but soon realized that he would not be able to obtain the level of detail due to the lack of support for this airframe. Then he stumbled upon Ron Rollo’s site with photos of his Learjet 45 cockpit shell and then followed a link to Eric Tomlin’s site and determined that there was in fact a decent size support group for the Lear45. Shane had found the flight deck he wanted to build and a site offering the support that he would need as a new builder here at hangar45! That was 2008. 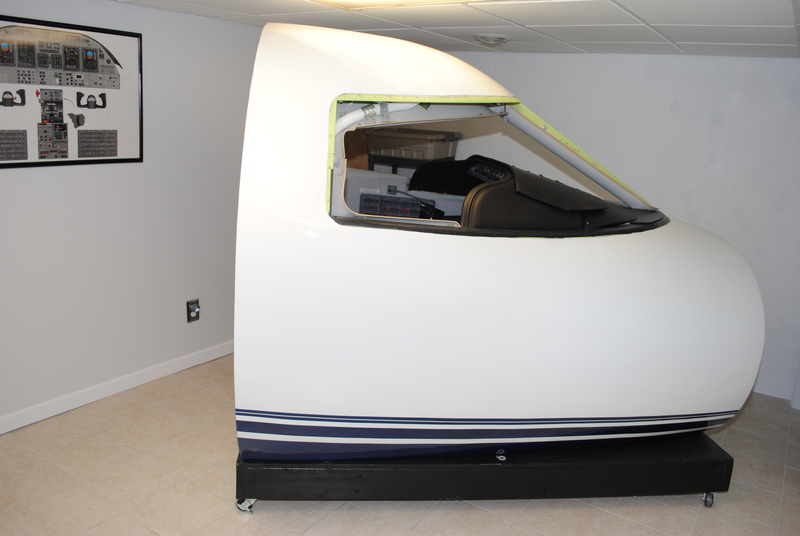 Shane built a simulator cockpit based upon the Learjet 45 using one of Ron Rollo’s shells @ PROJECT45 (airframe #L45-007). 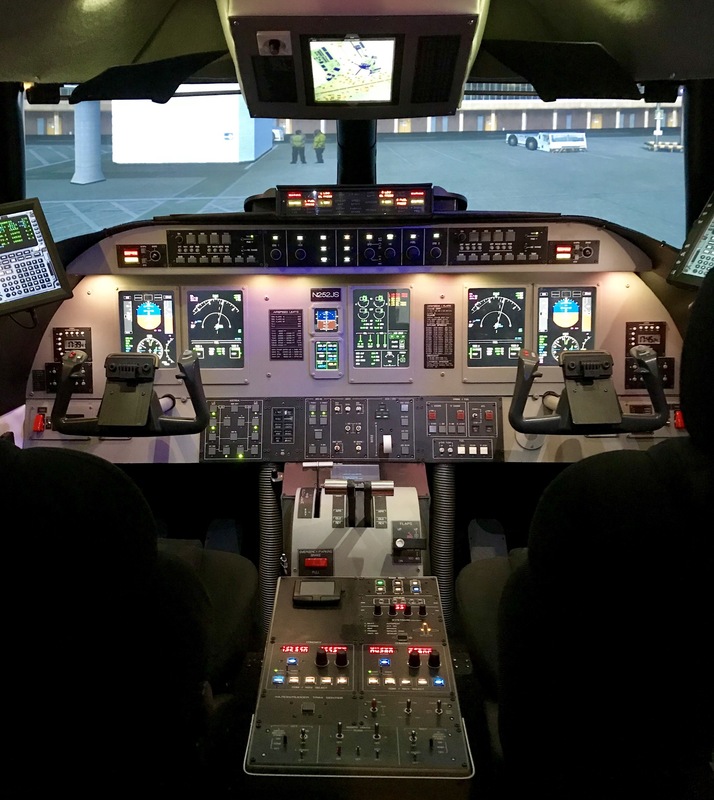 He wanted to replicate the flight deck of a real Lear45 as close as possible utilizing the software and hardware available and that is exactly what he did! 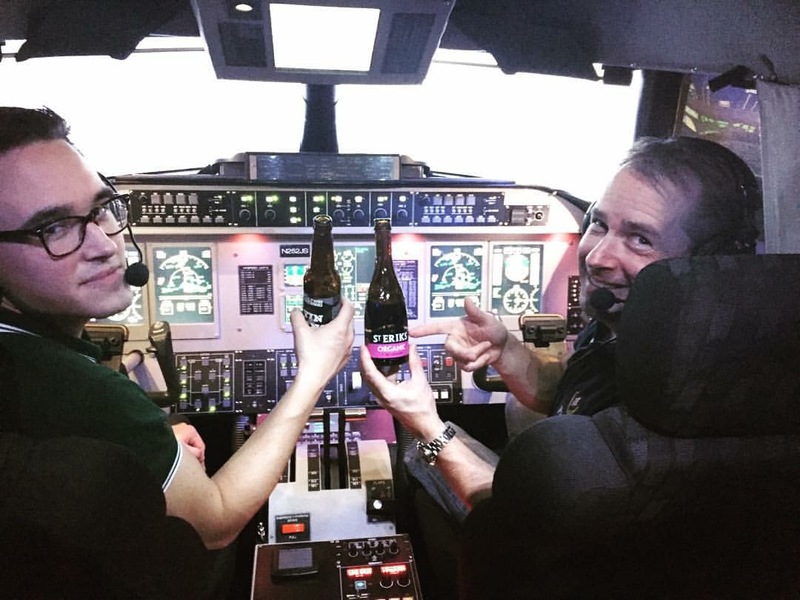 At first glance at the photo above, you might say, “That is what I want to replicate, a real Learjet 45 cockpit!” Well that is exactly what Shane did and what you are looking at is his home build Lear45, L45-007, a full scale 1 to 1 replica of the real aircraft! Only real world Lear45 pilots would be able to point out the discrepancies! (The basement wall gives it away too!) 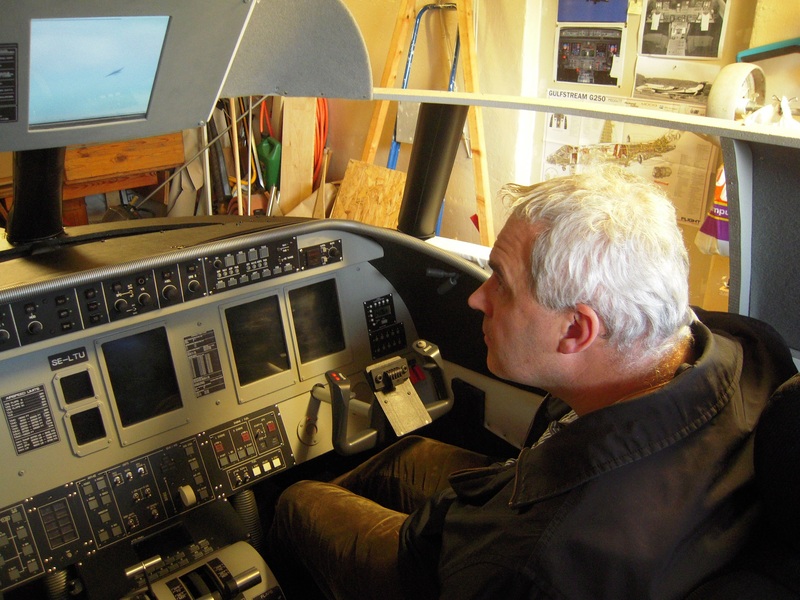 Shane is using three flat screen LCD HDTVs for his outside visual system and hopes to create an immersive environment where his guest pilots have a real sensation of flight. 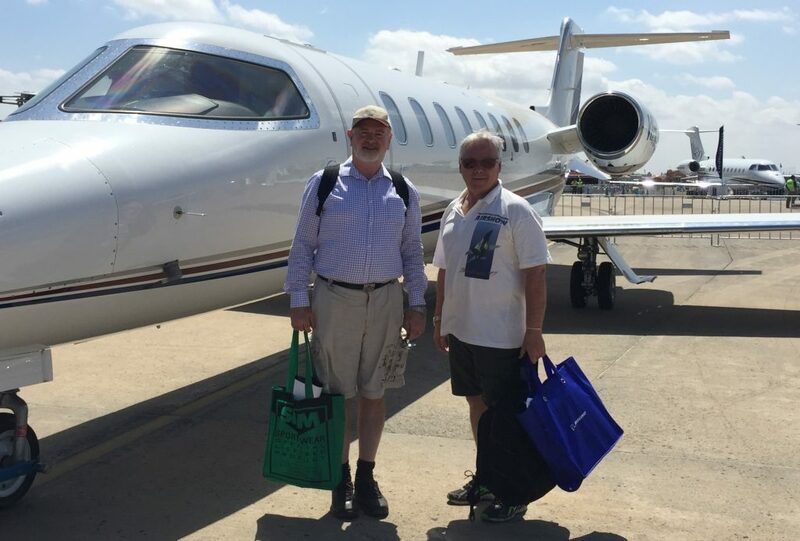 No doubt Shane has created a textbook example of a home built Learjet 45! To date it is about 95% complete but then again, will any of our projects ever be considered 100% complete? 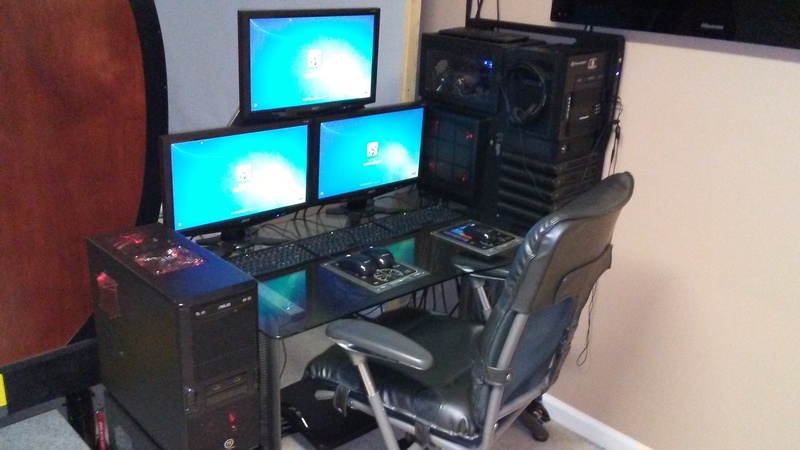 Take a look at his Featured Projects Photo Album to get a good idea of what his simulator is all about! The Down Under Australia Lear45 Project! Mark Speechley is happily married to his wife Jill and lives “down under” on a horse farm just outside of a little town called Traralgon, Victoria Australia. His professional life consist of “straightening” clients out as a chiropractor. Mark is a family man and loves spending time with his friends and family barbecuing any chance he can get. 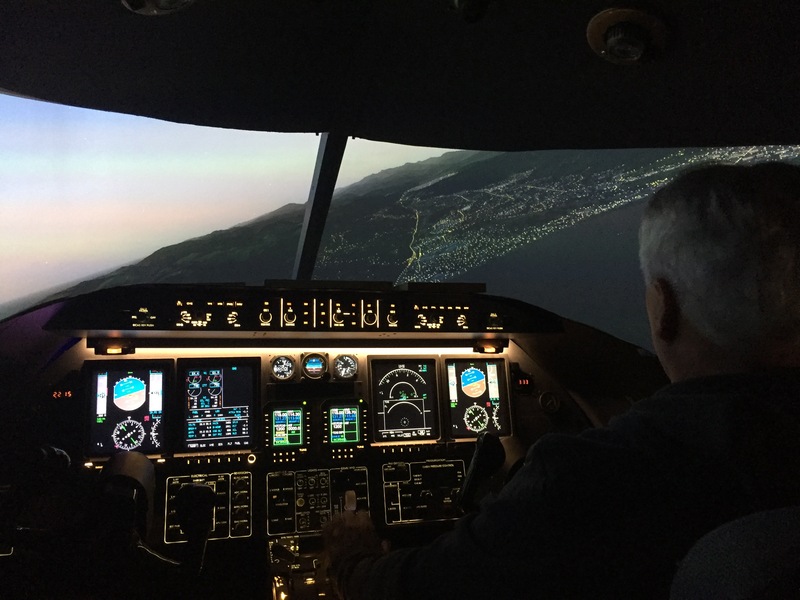 He has had a deep passion for aviation and finally decided to build a home flight simulator modeling the Learjet 45 but there was a problem……….where to start! Fortunately for Mark, his best mate, Mark Cooper is a master carpenter. (If he wasn’t before, he is now!) 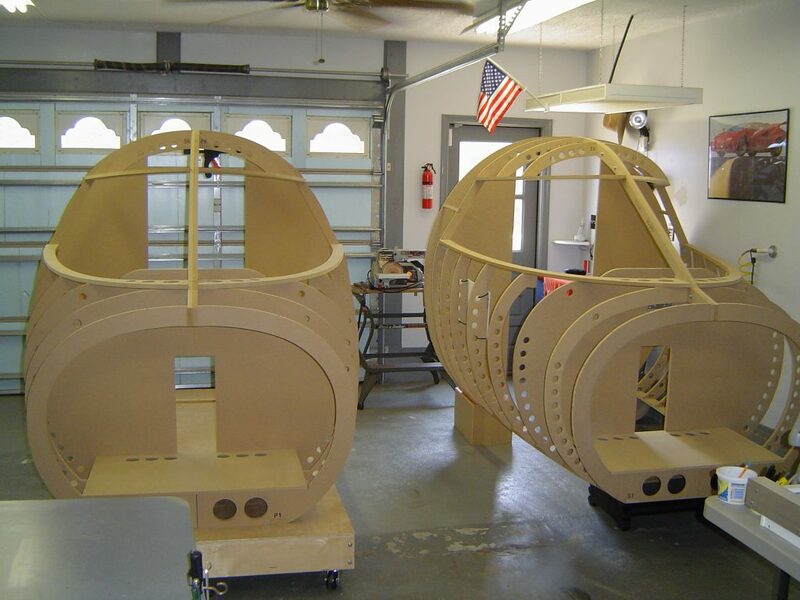 Mark S. found Hangar45 and reached out to Ron Rollo to order shell L45-012 in paper plan format. Mark would have loved to have just ordered a kit but shipping a crate 12,000 miles was a little cost prohibitive to say the least. That is where Mark C. stepped in and took the lead on the shell construction from paper plans to full scale cockpit structure! 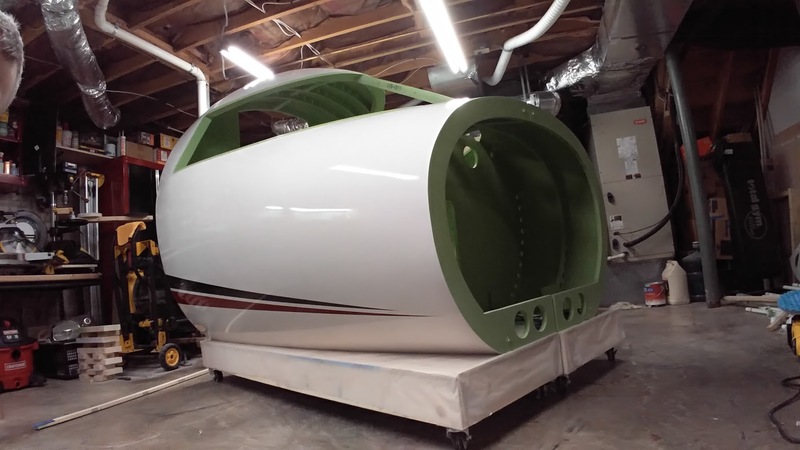 Mark and Mark were the first Project45 shell builders to successfully build a Lear45 shell from paper plans and they did it with perfection! 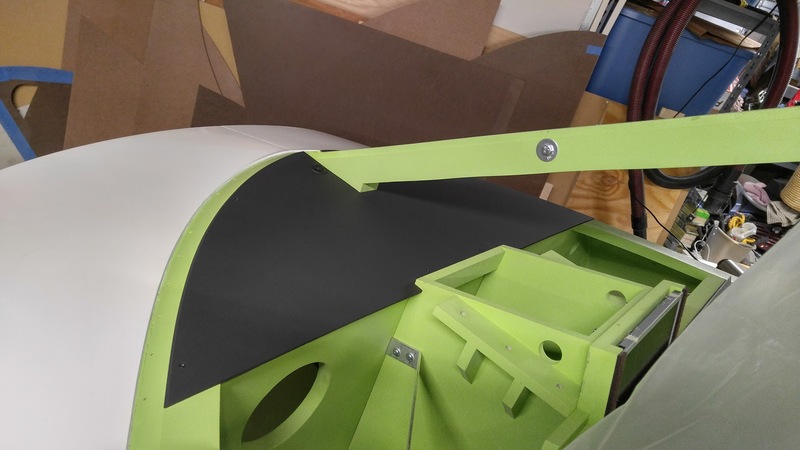 While Mark C. was busy building the structural aspects of the shell and interior furniture pieces, Mark took the lead with putting together the MIP, lower panels, center pedestal panels and working out the issues with getting all the software programs to work nicely together. Mark also spearheaded the outside projector visual system, not just for his project but also for the entire Hangar45 club! Mark has the most advanced projector visual system within the Hangar community to date! Mark is 100% committed to the project and to the Hangar45 community. 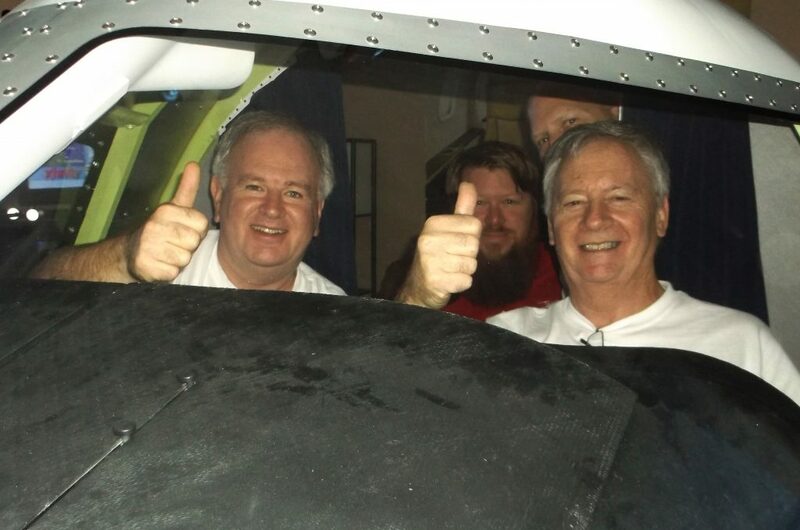 Mark also holds the record for furthest traveled to visit and fly another member’s Learjet 45 simulator! Mark and his friend Peter made the long journey from Australia to the 2016 Hangar45 “Meet and Greet” in Jacksonville Florida. That is basically traveling half way around the world which is about 11,400 miles, but who’s counting. Pictured below is Mark on the left, Peter on the right, Eric Tomlin in the background and Ron Rollo peeking into the photo. “My name is Mark Speechley ( known around here as Mark S. due to the number of Marks’ in the Hangar ) and I knew back in 2010 that I was going to build a cockpit. 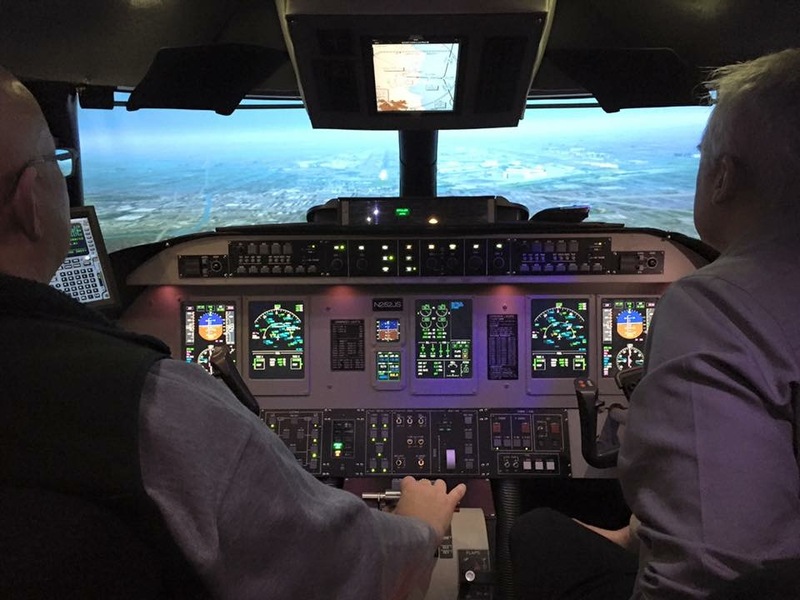 I was given a voucher to fly in a 737 simulator in Melbourne and I found it quite easy having flown desktop simulators since the Sublogic days on my Amiga computer. 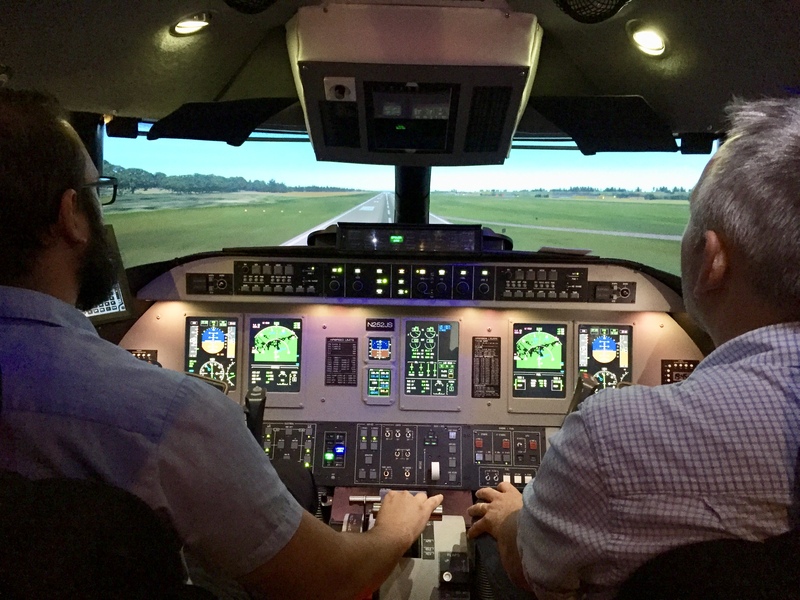 The pilot in the 737 was so impressed with my simulator flying skills that we deviated from the normal route and tried to land the 737 at St Barts in the Caribbean. No mean feat for anyone if you are familiar with that airport. After that experience, I was going to build a 737. I duly did 6 months of on-line research and had the plan mapped out. Somehow trawling all the wonderful sim sites I came across Hangar45. Not thinking of a Learjet, I started communicating with one of the Hangar’s founding member’s Eric Tomlin. What a wonderful example of a member who was here to help everyone and to highlight what a wonderful group of members and Forum that they had built up. Eric convinced me that whereas the 737 had some wonderful attributes for building, the Lear45 had access to thousands more runways to explore. That was the clincher and a fact that most potential builders do not factor in. In the sim world we can do more things you can’t do in real world so you can explore more parts of the planet and fast in the Lear. 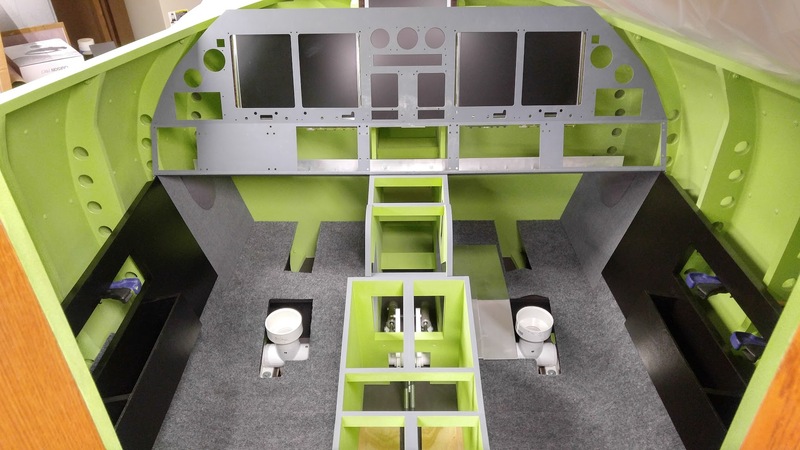 So after deciding on the Learjet 45 to build, I had to choose from a number of ‘cockpit panel’ suppliers. It greatly helped at the time for the very favourable dollar exchange rate and cheaper postage rates. So this was 2011 and the forum was a buzz with many very knowledgeable and resourceful members chipping in with research on all the different parts to emulate the Lear. Ron Rollo was one of the main catalysts for the success of the forum brilliantly designing the plans for the actual cockpit. He either made the parts for you and you then put the shell together or in my case I purchased the plans only and built everything from scratch. It was at that point that I enlisted my best mate, pilot, trained commercial pilot and plane builder ( Vans RV-8 ) Mark C. ( Mark Cooper) to undertake the building of the shell from Ron’s plans. May I say he did a wonderful job but some of the credit must go to Ron as his instructions were very well done. It was left to me to do all the building on the inside. Well the forum was flush with drawings for every main detail required, so it made dealing with tradesman easier. I suppose the biggest undertaking for us Lear builders was the MIP ( Main Instrument Panel ). It had to be cut out and bent at the right angle or if you got it wrong you would be stuck at square one. Fortunately for me, mine was finally completed and was then sent to the automotive spray people to have it’s grey colour finished off. 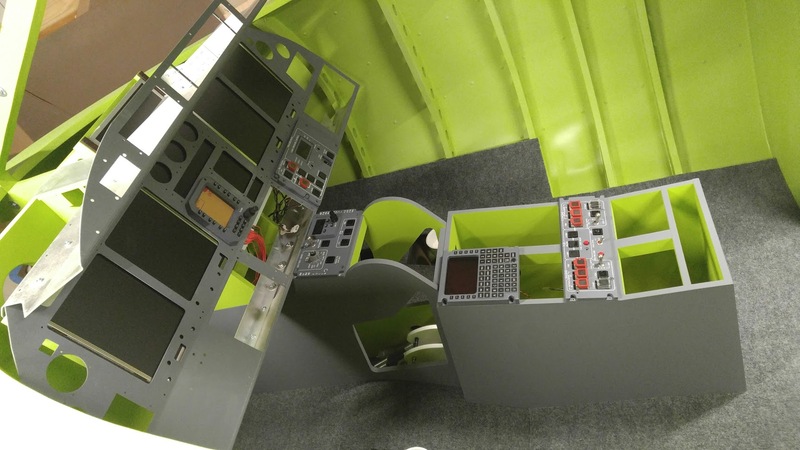 Once done you now had the instrument panel that you could populate with panels that were up for purchase. I would put in my orders for new panels that were coming up and duly waited for them to be completed and shipped to Australia. The times were on average 4- 6 months which seems like a long time but in essence you had so many other things to attend to in the mean time. There was wiring, soldering, purchasing parts that were not included such as yokes, switches, buttons, LED’s. This did not even include the background knowledge and skills you needed to acquire such as electronic, basic electricity, soldering etc. 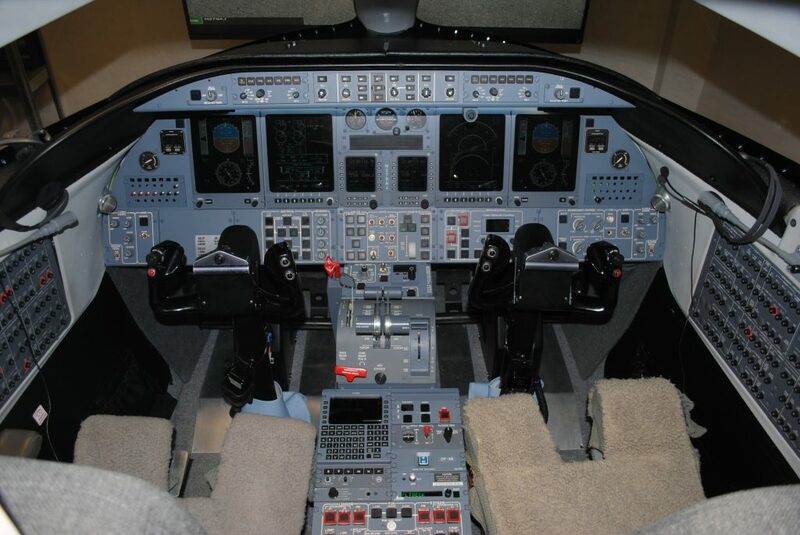 I haven’t even begun to talk about the software which you needed to acquire such as FSX or Prepar3D, FSUIPC and the wonderful JET45 software from Jason Hite and Eric that allowed the Lear instrument panel to emulate the real Learjet 45. You next needed to scan the forum sometimes multiple times throughout the day in order to find out who has discovered something new or maybe a different procedure that was cheaper or more efficient. It may be how to adapt a real aircraft part to incorporate it into the Lear build. If you scan the forum you will be amazed at just what a knowledge base has been amassed on all manner of topics. My build was at a time when adding photos was easily done and added greatly to the explanations people were putting forward. Unfortunately many of the photos have been blocked due to primarily Photobucket withdrawing support. Fast forward to 2017 and from my photos you will see that the 2 Marks have built, in our version, a wonderful ( but still evolving ) Learjet 45, that gives us and all of our friends a jaw dropping experience. 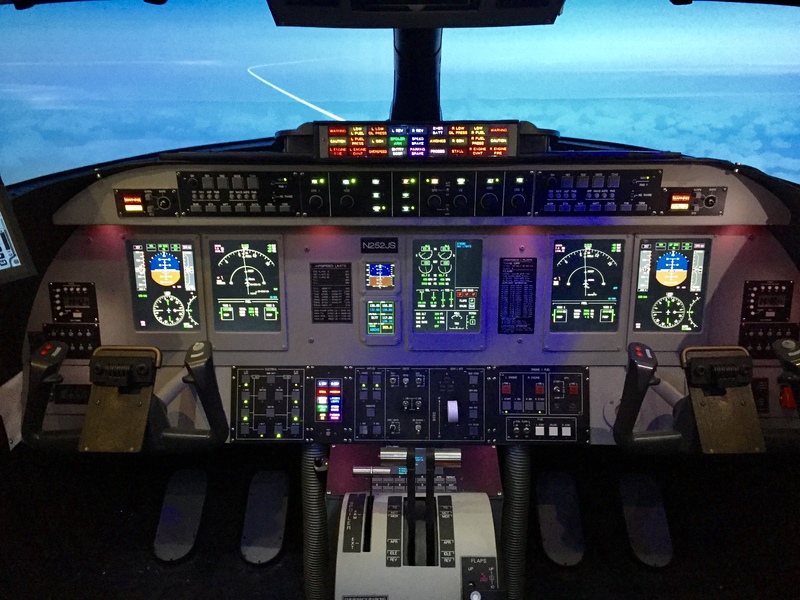 When coupled with, in our case, three BenQ 1080p projectors, three computers, P3D4.1 and numerous ORBX scenery as well as many other 3rd party software such as REX, it is an experience that is better than what I experienced way back in the original 737 simulator! The Cleanest start to a Lear45 sim you have ever seen! 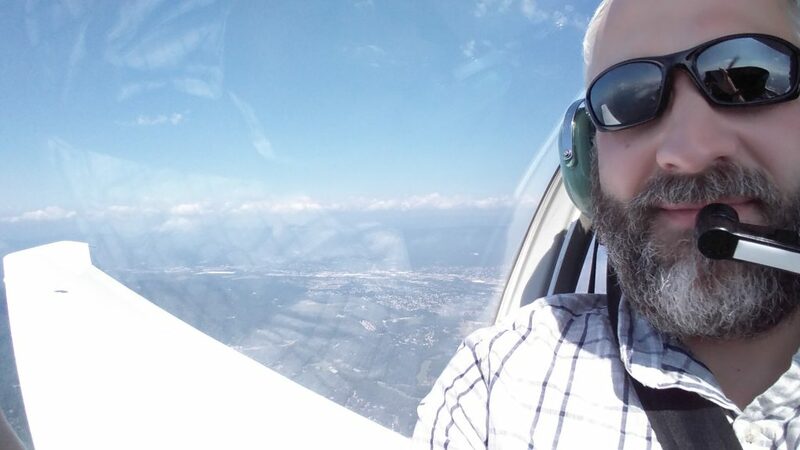 Maciej (pronounced Macie-j, Machie or “Magic Mike”) was born in Gdansk Poland in 1973 and has had a love for aviation ever since he was bit by the bug years ago when his father was working on his glider pilot’s license. He will never forget the day his dad gave up his seat to let his son go up to see what it is all about! 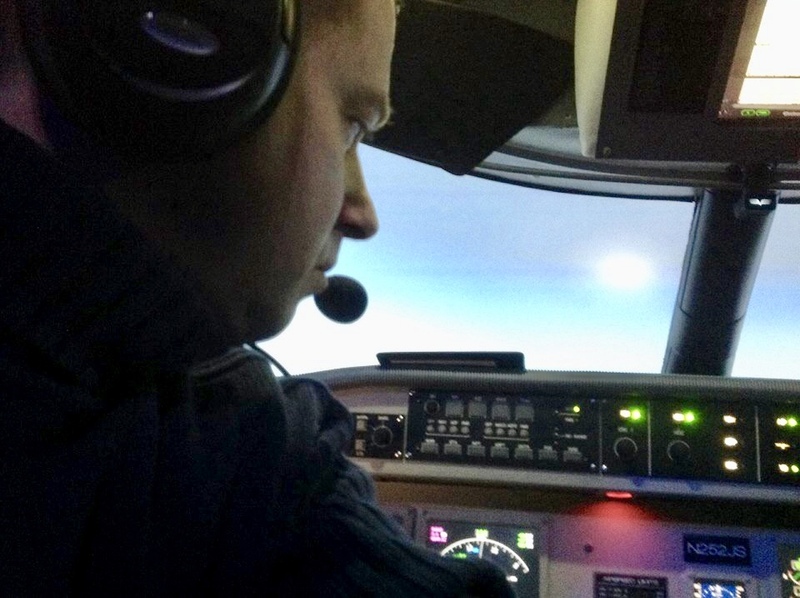 Maciej deep rooted love for flying had him spending countless hours searching the internet for ideas on how to build a home flight simulator. Most of the time he ended up lost and overwhelmed……..that is until he found Hangar45! After doing some more reading and research within Hangar45, Maciej decided to join the Hangar and start his very own project. 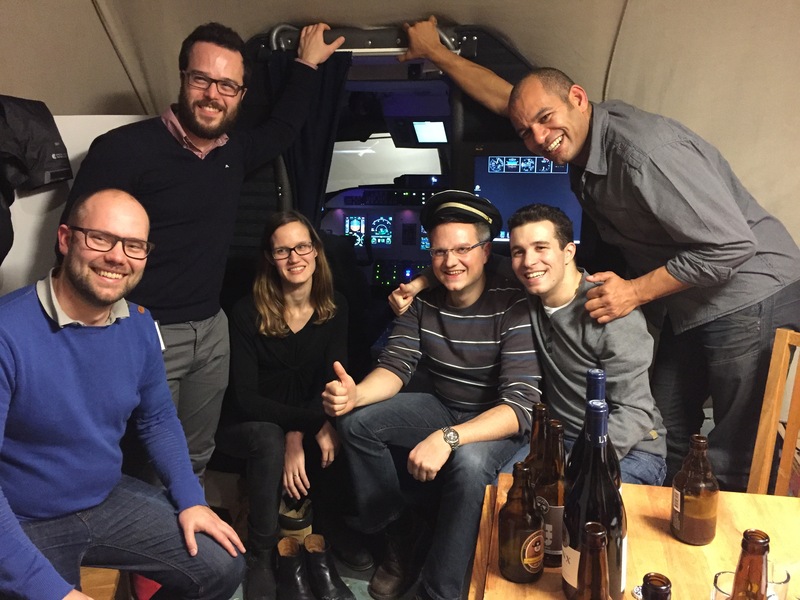 Maciej is not a pilot nor had much to do with flying in the past except as a passenger on big transatlantic jets, although he wants to eventually obtain a private pilot’s license one day in the future. As it turns out, the number 13 is Maciej’s lucky number and how lucky he was to get it because no one else would have it! Although Maciej could have placed an order for the shell kit, he opted to receive it in paper plans format and take the project head on. Maciej is one of only a handful of hangar members that has completed the shell from paper plans and has done it in text book fashion! Take a look at Maciej’s Learjet45 shell, L45-013! It looks totally amazing and it is even more amazing knowing it is all created from paper plans! Maciej’s shell is finished off with three layers of mat fiberglass and what could certainly pass as a professional paint job. Completing the shell is a gigantic mile stone with a project like this but once it is done, it is done and from here on out, Maciej will feel as if he is working on an actual “transport structure” of sorts. Maciej is in the process of gathering hard to find parts and learning how to interface switches and hardware. One of the things that he has picked up is Randy Buchanan’s incredible dual rudder pedals. A Hybrid version of the Lear45 from Stockholm Sweden! 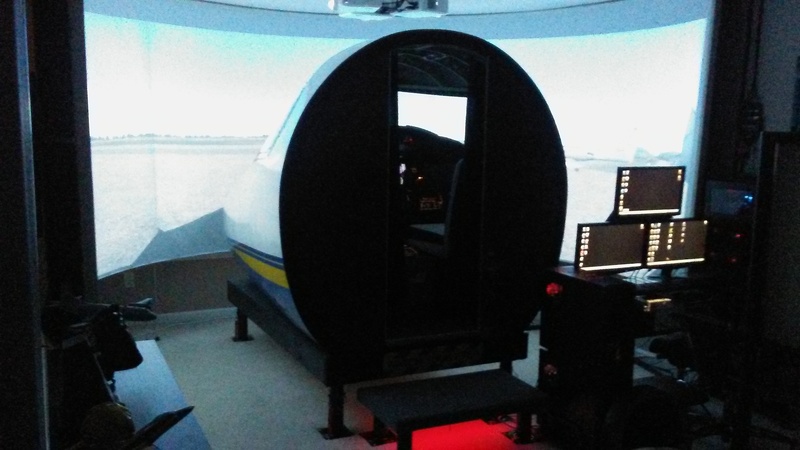 The Learsim simulator is located in Vasteras, Sweden. Swedes wonder if the name Vasteras inspired the author George R.R. Martin to name the World of the 7 Kingdoms in Game of Thrones to Westeros. Who knows…. Per Alm is a physician, specialist in neurology. 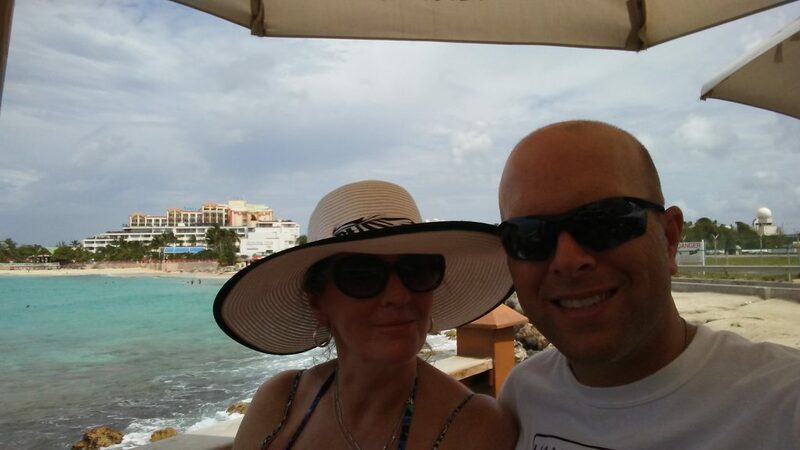 In his off time, Per enjoys playing golf (4 handicap) and play the guitar outside of work and flight simulation. 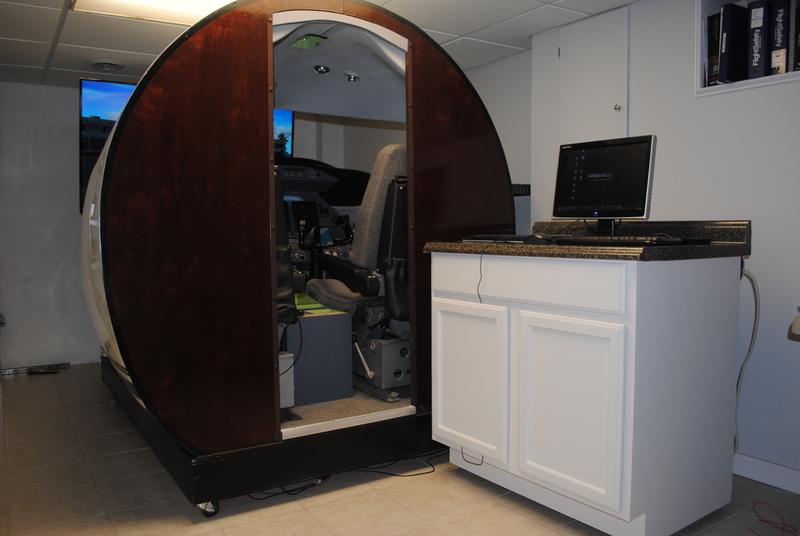 Per has been flying flight simulators for many years and his interest for the hobby never seems to stop. He has flown most of the PC based simulators on the market from the Falcon 4 (and many other military based simulators) to civilian Sims like Microsoft Flight Simulator, starting with FS98. 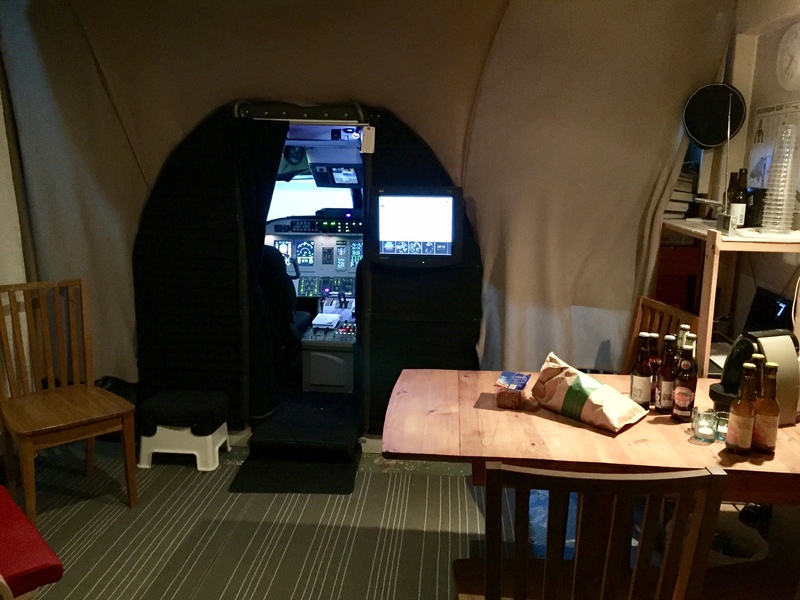 Per’s dream to build his own home built simulator was planted when he saw that some of his friends built three different PC based simulators using real aircraft cockpits. He is lucky enough to fly them from time to time at the local air museum in his town! In 2006 he started thinking about making his own cockpit. Per had a few good friends team up with him, Lars and Pelle who are also very much interested in simulators and flying in general. After a month of planning, they started to build a Learjet 45 (A good choice for many reasons as you know.) As their project moved forward, they developed many “customized solutions” and found them to be very helpful in solving many of their technical issues. However, this is why their Learjet 45 flight deck really looks like a mix of several Bombardier and Embraer flight decks. 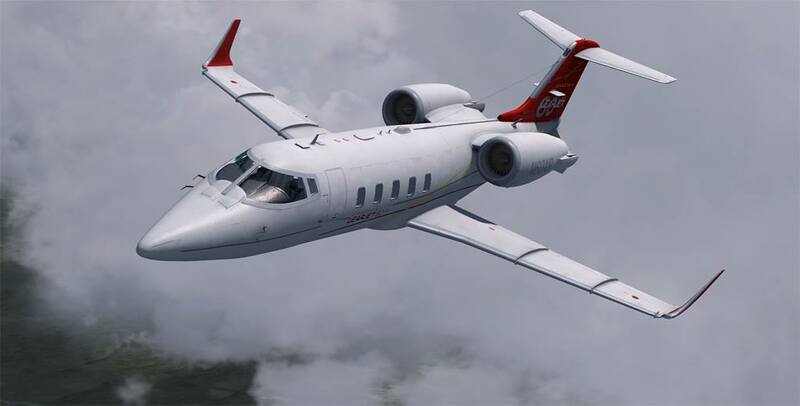 Their simulator will however be based on an enhanced version of the default Learjet 45 in FS9. Over the years they have flown different business jets like Learjet, Embraer Legacy, CRJs and Gulfstream. 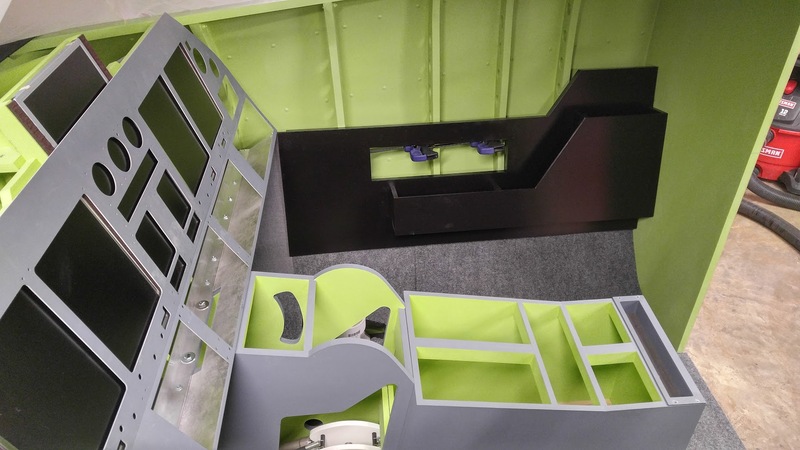 Per is responsible for the design of the cockpit and has done all the planning so far for their simulator, including the design of the custom panels. 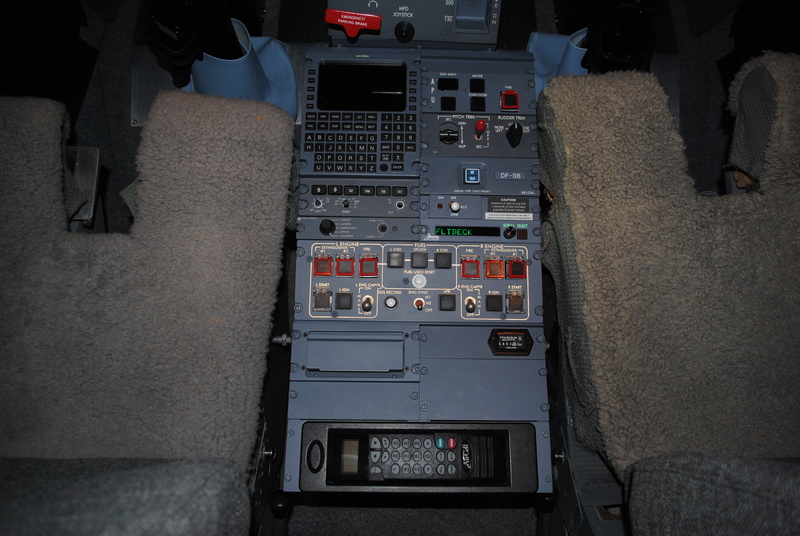 Some of the panels are more or less replicas found in the original Learjet 45 flight deck and some are custom designed panels. Per is also responsible for the software, installing enhancements and all of the add-ons for FS9. It’s truly an enhanced version that they have with all the add-ons one can think of. That’s why they are not in a big hurry to move on to FSX/P3D/X-plane. Lars is working on the network and interfacing. He is also doing some detailed programming which we all know is a hobby within a hobby. On top of all that, Lars is the webmaster and is responsible for updating their website, “www.learsim.se”. Today they use Arduino boards for interfacing and Lars does all the programming. 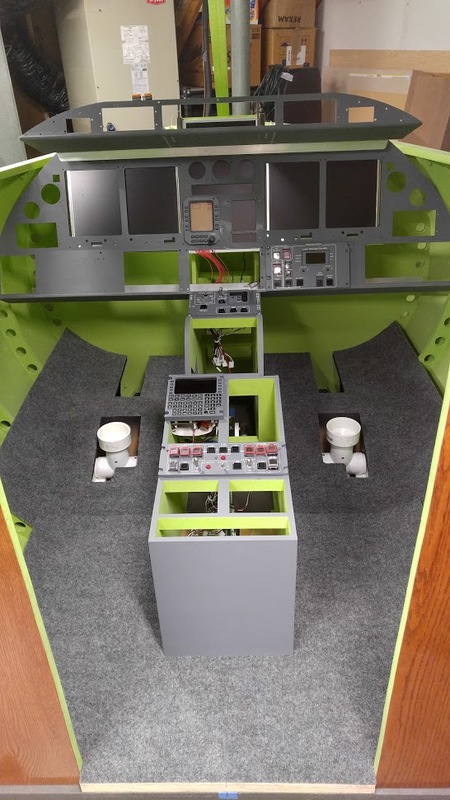 Since they make everything from hardware to software they can pretty much design and build any system in the cockpit as needed. Pelle is really more or less the carpenter and fabricator in the group. He is very skilled when it comes to building different things, especially with wood. Pelle has built two real airplanes and is also working on older cars for example a Triumph sports car just to name one. He really knows a lot about how to build things properly. Pelle has a private pilot’s license and flies in the real world from time to time. 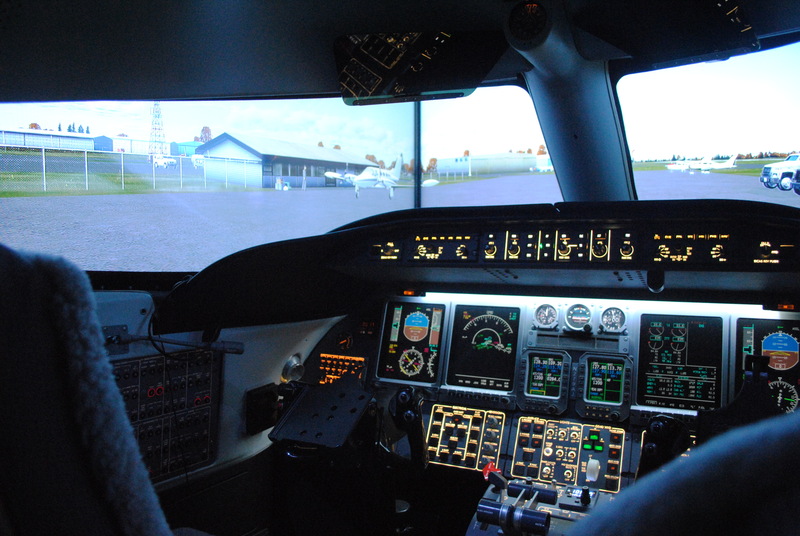 The Learsim group now plan to finally switch from FS9 to the more modern Prepar-3D-v4. They have done test flights in X-plane 11 which looks fabulous, but it lacks too many features compared to Prepar-3D. Per therefor finds Prepar-3D more suitable for the Learsim project. Actually Per is also eager to find a new suitable Learjet model (back to the roots) for the project and maybe the promising Milviz Learjet 60 model for Prepar-3D v4 could be the perfect match. It has a similar flight deck compared to the Learsim flight deck with the warning/caution panel on top of the MIP. 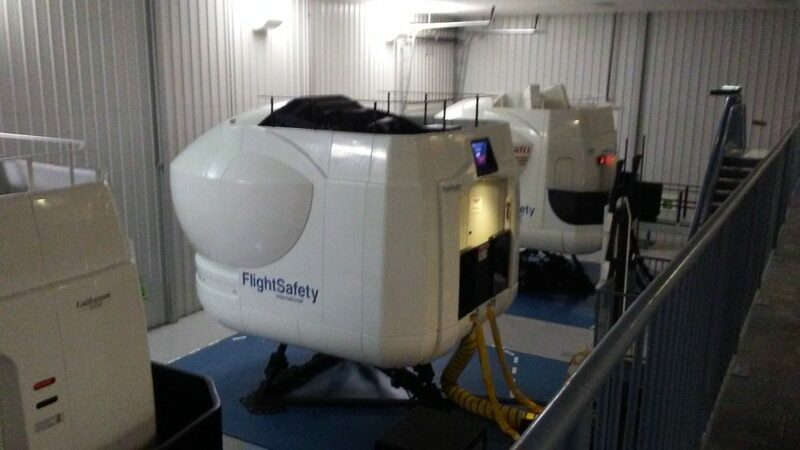 And with the new, more powerful flight simulator, a three projector system for wider view will be possible to implement. 1 main PC, to handle the outside environment views! Voice Activated Commands – we now talk to the controllers in Radar Contact. ’Almost as real as Vatsim’. Extensive lighting possibilities in the cockpit to simulate different times of the day. Per’s ultimate goal is to finally switch from FS9 to the more modern Prepar3D v4. Actually Per is also eager to find a new suitable Learjet model (back to the roots) for the project and maybe the promising Milviz Learjet 60 model for Prepar-3D v4 could be the perfect match (http://www.simflight.com/wp-content/uploads/2017/06/Milviz-Lear-60-XR-Preview-June-17.jpg). 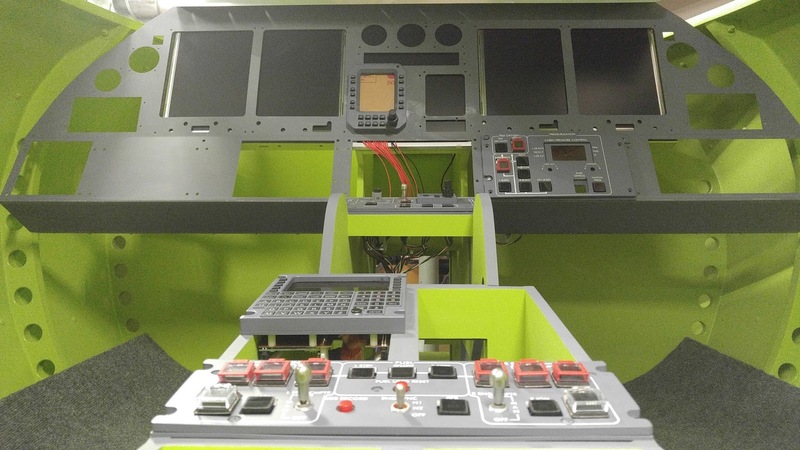 It has a similar flight deck compared to the Learsim flight deck with the warning/caution panel on top of the MIP. 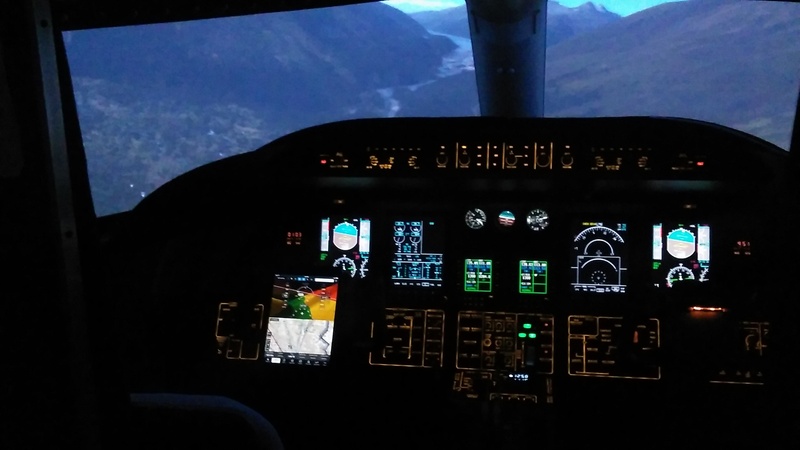 And with the new, more powerful flight simulator, a system with 3 projectors for wider view will be possible to implement. They plan to use photo resistors and sensors to scan outside view and connect them to RGB-diods via Arduino bord. 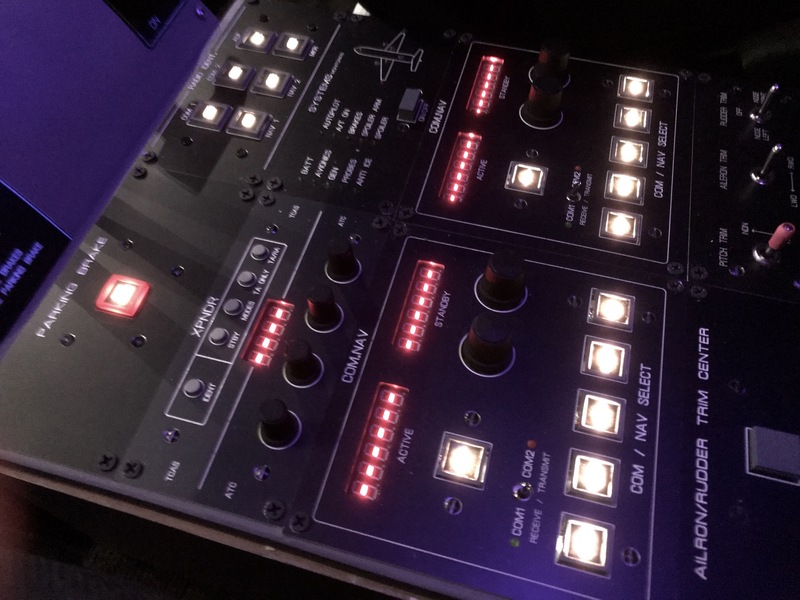 The diodes are positioned outside cockpit and the system will simulate different lighting shining into the cockpit. Anything is possible with Arduino! Additional Featured Projects will be added to this page once we get Hangar45 fully established!